In the wake of 1986's True Blue album, Madonna appeared in feature films 'Shanghai Surprise' and 'Who's That Girl'. Despite both movies receiving mixed reviews, the latter's soundtrack album - which featured Madonna on four songs - fared well, breaking the Top 10 in 15 countries and selling more than six million copies worldwide. To capitalise on this success, Madonna set out on the Who's That Girl Tour, her first international sojourn. Comprising 38 shows across Europe, North America and Asia between 14th June and 6th September 1987, the tour was an extravagant affair, boasting complex choreography, multiple costume changes and elaborate stage sets. The project was a spectacular commercial success, grossing over $50 million, and breaking numerous attendance records; her show at the Parc de Sceaux, Paris was witnessed by an audience of 131,000, the highest attendance ever for a female artist at the time. 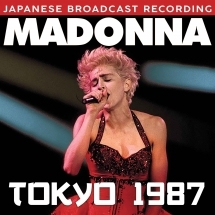 Of the 1.5 million fans that flocked to Madonna's performances during this jaunt, it was those who attended her concert at the Korakuen Kyujo, Tokyo on 22nd June that caught perhaps her finest show of all. Recorded for live broadcast nationally, while also synced across the US, and featuring a wide array of hits from across her career, this legendary event is now available to relive once again on this CD.